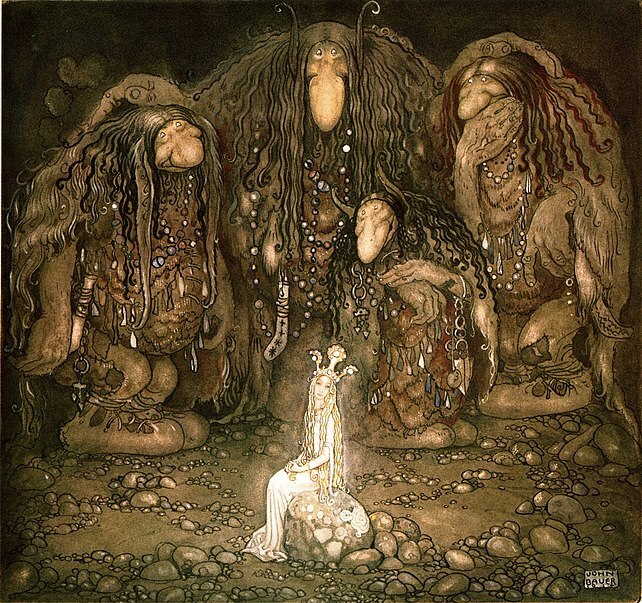 Trolls are originally from Norse mythology. They later moved into general Scandinavian folklore. Hideous, deformed, dimwitted, very old and strong, trolls are giants compared to normal men. Trolls have always been the unkind kin to the jötnar. They live alone or in very small packs, usually in the countryside or a mountainous area. Trolls are lonesome and rarely friendly. Also, they tend to be highly suspicious of anything new in their surroundings. The age and wisdom trolls have give them an uncanny edge to magic, allowing them to control the primal forces of nature and the elements. While powerful, their magic is unsophisticated and sometimes even clumsy. Trolls hide away from the deadly sunlight that can turn them to stone, spending time in caves during the daytime to rest. Many odd mountains and rock formations are said to have been trolls either caught in the daylight or hit by the lightning, turning them to stone right where they had stood. The trolls were societies way of explaining formations of rock, mineral deposits and even disappearances of people and livestock. Their appearance and size as well as brutish behavior tended to be used as a deterrent to children inside before the woodlands got too dark. It was also a way to ridicule bullies with younger children, and to coax them away from their bad behavior. Scandinavian tales speak of multiple breeds of trolls. There were forest trolls, swamp trolls, ice and fire trolls as well as mountain trolls, who were giants even to other types. Very strong magic can be used to wake up a troll that has become stone. However, it usually involves a sacrifice or two. Trolls are rarely cannibals, but they eat humans very eagerly, viewing them as a lesser than species. When trolls migrated, they take on characteristics of their new home, for instance a forest troll can become swamp troll-like if it moves to a swampy forest after a while. So, what are your thoughts on Trolls? Have you read, watched, or played something with one in it? We have trolls on the internet now, don't we? LOL. The Scandinavians had, and probably still have, wonderful imaginations. I wonder who they based the first troll on? He/she must've been a terrible sight. I didn't realize the trolls were Norse in origin, but I guess it makes sense. Can't say i like trolls :) but sure liked your post. Love wha you've been doing for A-Z! I love the header on your blog. Nice. I didn't know where trolls came from. Really interesting. Speaking of Trolls! http://trailers.apple.com/trailers/independent/trollhunter/ I just watched this trailer yesterday. Fascinating! I didn't know much about trolls (other than the kind I collected as a little girl with crazy hair and jeweled belly buttons lol). I've seen trolls in movies - old cartoons and animated movies that I can't think of the names of, and of course Harry Potter. Great post! Thank you for the comments everyone! =) I really appreciate you guys stopping by.